Hello hello! Well, it's mid-September and it looks like Spring has (tentatively) sprung! Although it's raining quite a bit and it's still quite cool, the days are getting longer and the sun is shining just that little bit more strongly. Woohoo! Speaking of Spring, I recently got sent some asparagus from the Australian Asparagus Council to celebrate the start of the season, and knew I wanted to make something special with it. This tart is very easy to put together - I actually made it on the fly on a weeknight straight after work (as well as a couple of other elements; see below), and was surprised by how pretty and impressive it looked. It was delicious fresh out of the oven, but also was hardy enough to make good leftovers for lunch the next day. Incidentally, this would make good picnic food! For the topping, I used ricotta, mixed with beaten egg to help it set and give it a golden sheen. And remembering that ricotta can be a black hole for flavour, I seasoned it very generously with salt, pepper, grated parmesan, lemon zest and cayenne. 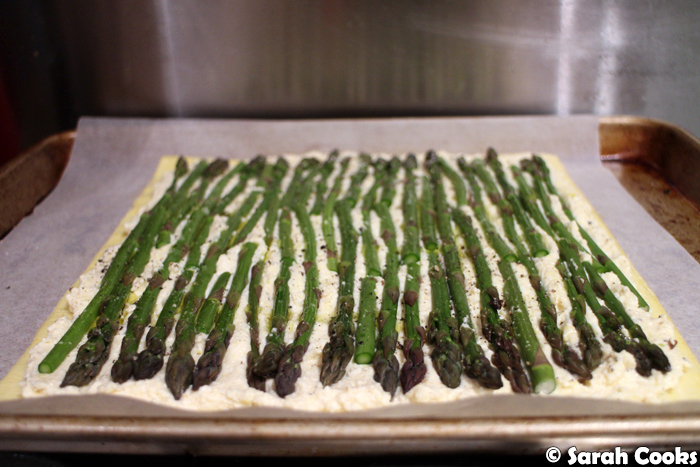 And then it was a matter of arranging the little asparagus spears like soldiers along the tart, gently pressing them into their ricotta mattress. A little more salt, pepper, and a drizzle of olive oil, and it was time for the oven! 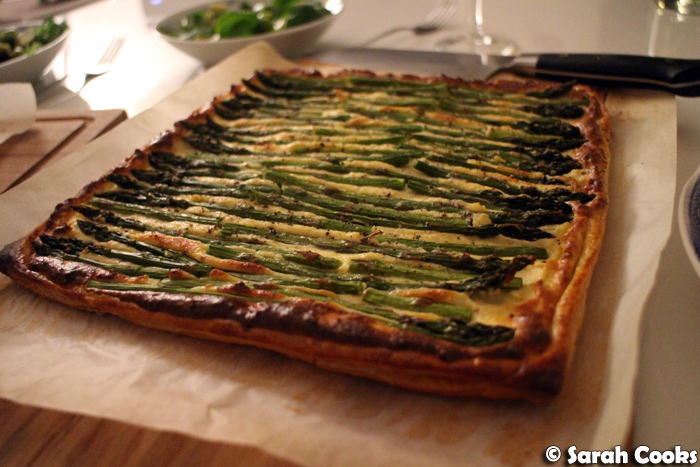 The tart was definitely a winner - crisp buttery puff pastry, a creamy filling, and the fresh greenness of the asparagus. I loved how the asparagus got a roasted flavour from being cooked in the oven. (Usually I eat asparagus blanched or steamed, so it was nice to have it in a different way). 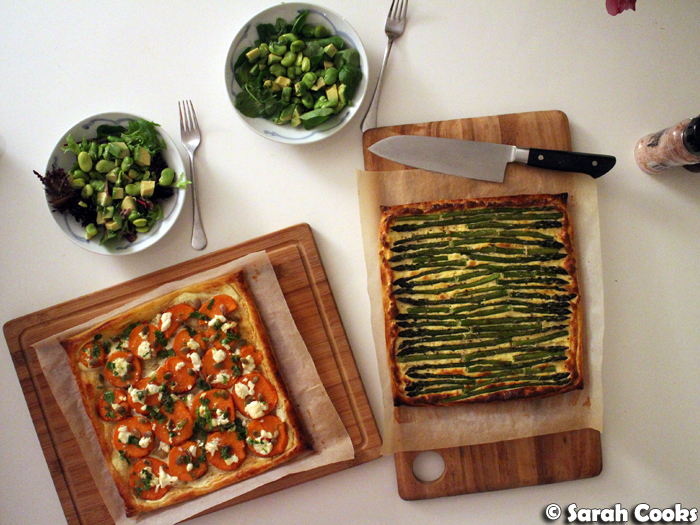 For this particular meal, I actually made two tarts - one was the asparagus tart, and the other was an old favourite, the wonderful Ottolenghi sweet potato galette. One tart is a meal, two tarts is a feast! 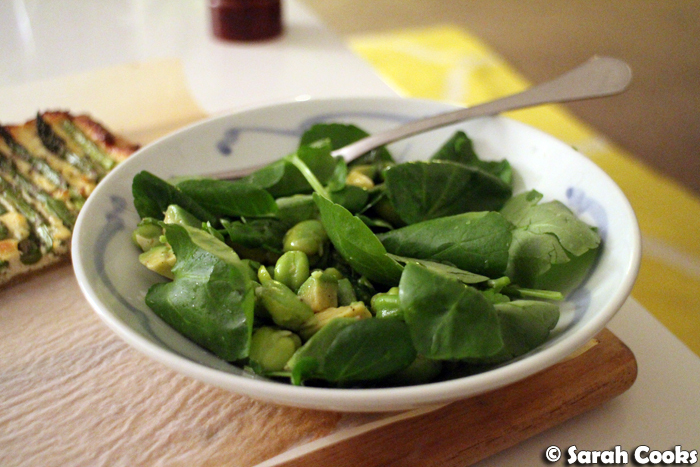 As an accompaniment, I made a sprightly springtime salad - watercress with avocado and broad beans, dressed with olive oil, white wine vinegar and some fresh mint. Spring freshness overload! 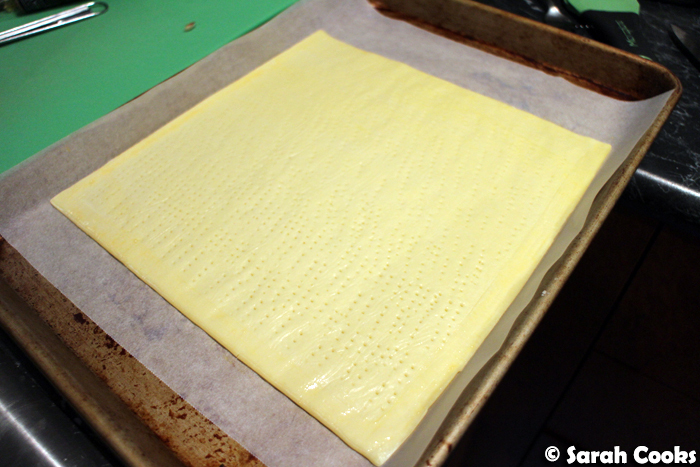 Place the sheet of puff pastry on the lined tray. Score a border 1 centimetre in from the edges. Prick the centre all over with a fork. Beat the egg in a small bowl. Brush the edges of the pastry with some egg. Mix the remaining egg, ricotta, parmesan, cayenne, salt, pepper, lemon juice and zest in a bowl. Gently spread the egg-and-ricotta mixture over the prepared pastry. Snap the woody ends of the asparagus. 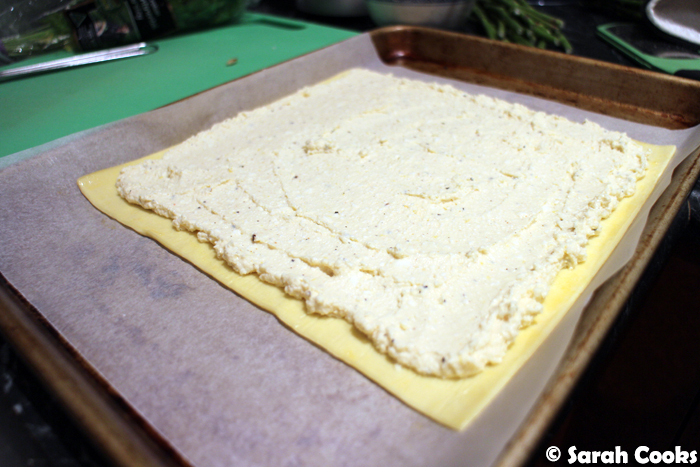 Arrange neatly on top of the ricotta and press down gently. Bake for 20 minutes, or until the pastry is golden brown and cooked through. Allow to sit for 5 minutes, then slice into portions to serve. 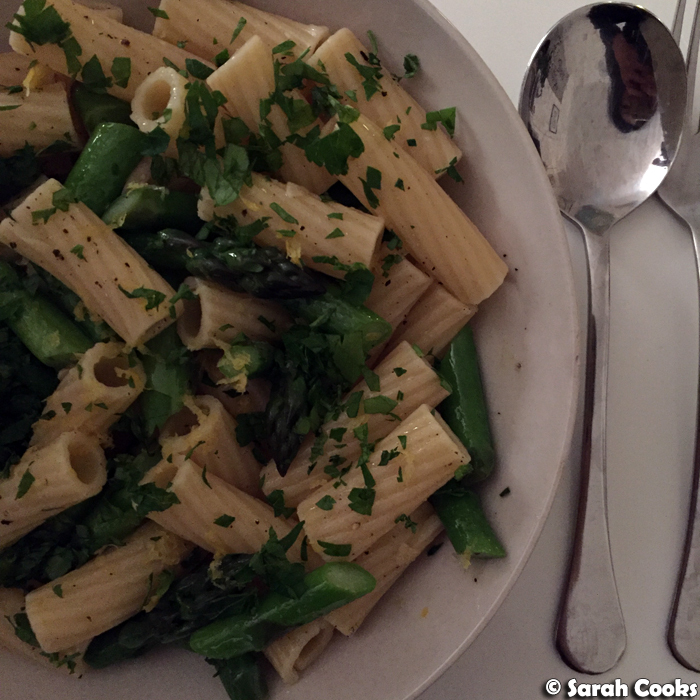 The first thing I made was Nigella's short pasta with asparagus, lemon, garlic and parsley. (Recipe in Forever Summer). This one is very quick to make, and I love the subtle, fresh flavours of the dish. 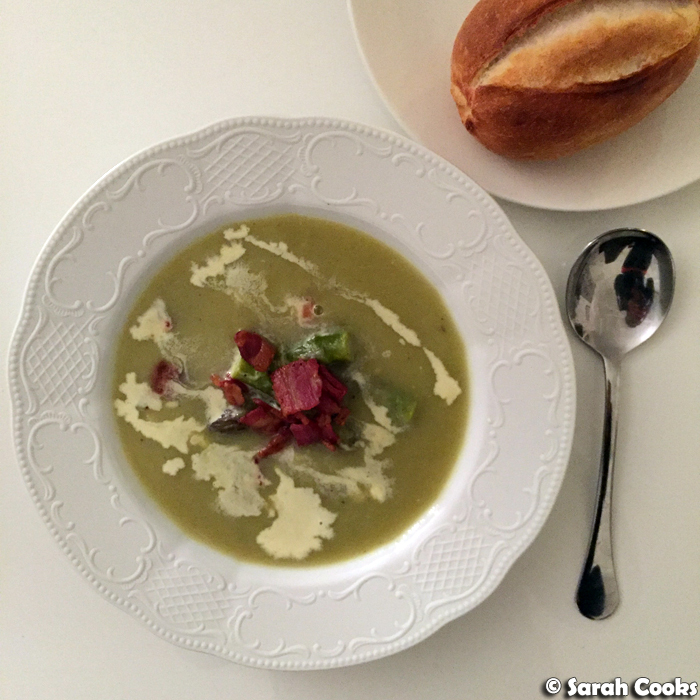 Sandra made a fabulous asparagus soup - to make this, you start by sautéing garlic and onions in a little oil, then add stock and chopped asparagus, and let it cook until soft. Then you blend it together, and it's soup! For extra fanciness, she cooked the asparagus tips separately and added them to the soup at the end, along with some crispy bacon pieces and a splash of cream. Finally, one morning I made an omelette with the asparagus. 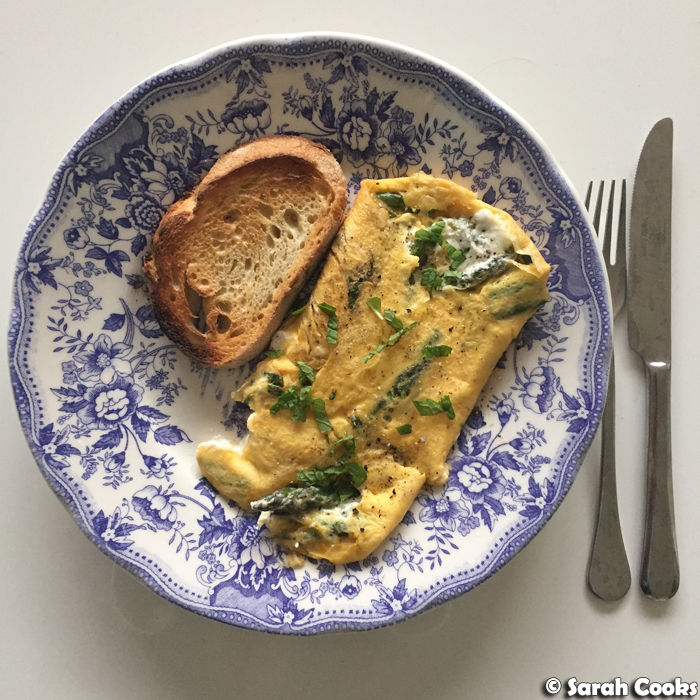 This was basically Nigella's Corsican omelette (i.e. eggs, butter, fresh mint and goats cheese) with some asparagus pieces folded through. Delicious! You really made the most of your asparagus Sarah! 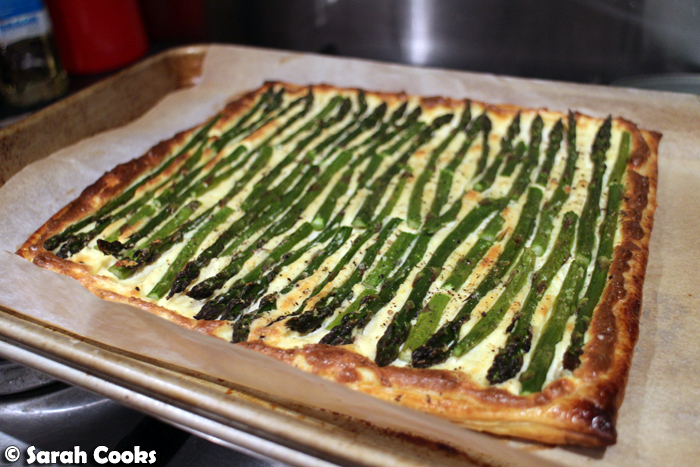 I've made that tart too and it really shows off how gorgeous asparagus is. 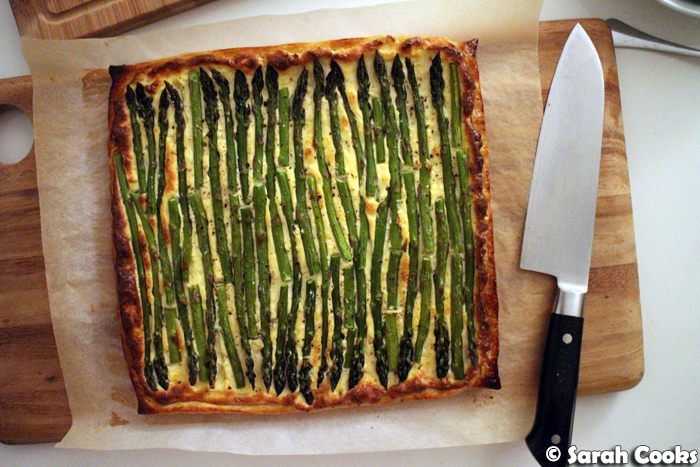 I remember seeing this asparagus tart on your IG and instantly drooling. It looks so amazing! And tasty!